Red Hat is a place I like to go for a either a special dinner or in this case, a special brunch. It’s sophisticated, but not super fancy. They have offered brunch for a bit now, but I could never find a good reason splurge a little on a special brunch. Until now. I made reservations on that Thursday, and thank goodness I did. Red Hat opens at 11:30. Our reservation was for 11:45, first seating, and the place was packed. 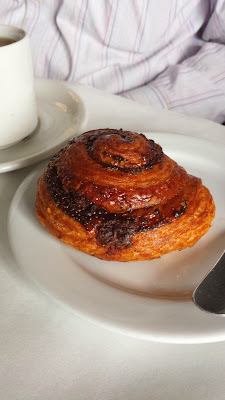 Promptly as the last of us slowly trickled in, I asked about the Breakfast Pastry selections. The menu noted that they were from Balthazar Bakery, the home of my favorite cranberry scone I usually acquire at Coffee Labs. The breakfast pastries were presented on a tray for our choosing. So many options! 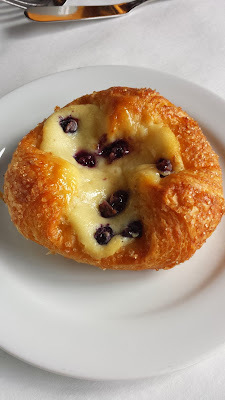 We settled on a chocolate croissant, blueberry danish, apple croissant and a cinnamon roll. 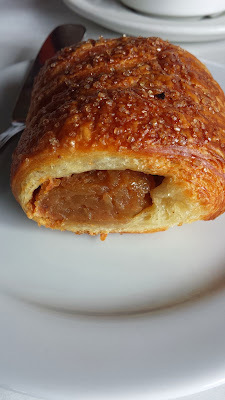 I had the apple croissant, and I liked it. The croissant was flakey, although a touch chewy. The apple filling was the right amount of sweetness. 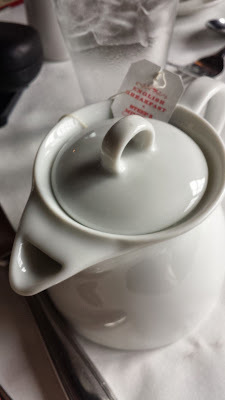 As I noshed on my breakfast pastry, I also enjoyed some English Breakfast tea, served in a cute little teapot that was big enough for two cupfuls. 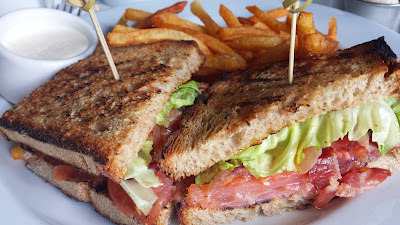 For my main, I chose the MackEEE, a sandwich of smoked salmon, bib lettuce, tomoatoes, onions and garlic aioli served on the side. It came with a choice of sides ranging from the healthy, salad, to the unhealthy, frites. I chose the frites. The sandwich was very good. The smoked salmon was not overly salty. The garlic aioli made it even better. It was a bit messy to eat since the tomatoes were very juicy. I did appreciate the choice of either mayo or ketchup for my fries. I chose mayo, since I didn’t know that the garlic aioli was served on the side. Since it was, the mayo was not even necessary. As we settled our bill, we were presented with a small dish of cream puffs and chocolate. Both delicious and a wonderful way to close off a celebratory brunch! The czar says: A great place to celebrate a birthday (there were two tables next to us doing so), to celebrate an accomplishment or just for something special without really breaking the bank. The menu is more lunch than breakfast, but whatever you get, it will be good. The location is amazing always has great views. I will be back. 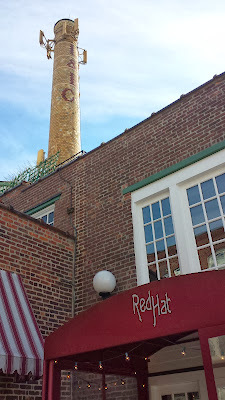 Go to Red Hat for the breathtaking views of the Hudson. I’m convinced there’s not a bad seat in the house, though it’s probably easy for me to say, since the several times I’ve dined at Red Hat, I’ve been fortunate enough to be seated right near the window. I love staring out at the river, the Palisades, and the outline of the Manhattan skyline in the distance as I enjoy my meal. 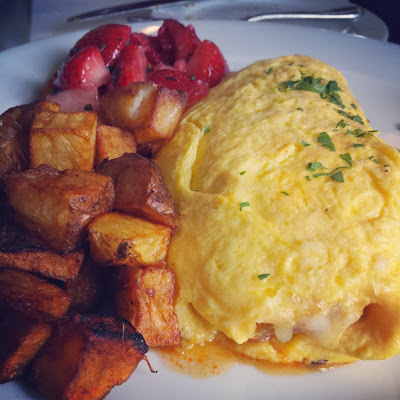 Though there’s a modest yet varied brunch menu, the $16 price accompanying all those items seemed, to me, a bit steep for what they are–French toast, an omelette, eggs Benedict, and a few others. So instead I chose one of the lunch items that I felt would be more substantial and a better bang for my buck: the grilled cheese on Balthazar rye with a side of frites ($14). The contents of the sandwich were a pleasing blend of flavors: Italian fontina, bacon, carmelized onions, and just a pinch of frisee (which I appreciated, not being a big frisee fan). I also appreciated that the sandwich was a manageable size, not overstuffed with ingredients. My only complaint was the bread. The poor Balthazar rye was very heavily grilled, so much so that one of the halves of the sandwich had a completely blackened crust. Some may like a heavy grill flavor, but I’ve never cared much for the taste of deep charring. I would have preferred a lighter grilling on the bread, at least not a blackened crust. I enjoyed the delicate complimentary cream puffs that were served at the end of our meal. It was a refreshing touch to close out the brunch. I love the atmosphere at Red Hat and all in all I’d say this is a great venue for an occasion brunch. So Red Hat in Irvington has brunch. Is it just another restaurant trying to get into the multi million dollar business of brunch just by throwing together some egg dishes? Well, if it is, they’re doing a good job. It may be a little pricey, but it’s another one do those not every weekend excursions unless you’re Richie Rich, but it’s nice for a celebration. As for the food, I had one of the Omelette specials. It had spinach, chorizo, cheddar and caramelized onions. Every bite was delicious. The eggs were fluffy and the flavors folded in made for a gooey mouthful of deliciousness. Red Hat, you’ve impressed me. 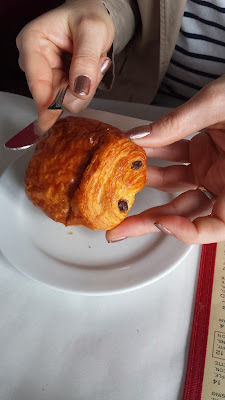 Meghan chose her chocolate croissant as a homage to MJ of the “Shahs of Sunsets”, when she got criticized by Mike for getting a chocolate buttery croissant. She also enjoyed the same omelette special since the waitress had her at chorizo. Should you go to Red Hat? Yes. Find a special occasion and give them a shot. You might want to call ahead for reservations.